Previously and recently refinished in Mapleglo by another restorer, this bass was acquired by a new owner who decided that a properly-aged Fireglo was the only way to go for an RM1999, so Studio California received the commission. We stripped it and sprayed it in a palette of Fireglo shades that precisely replicated a 51-year-old finish for color and pattern, minus the chips, scratches, dings, and dents that are typical of an unrestored instrument. For some odd reason, it had at one time been fitted with jumbo frets, so we de-fretted it and flattened and re-crowned the fretboard, then re-fretted it with correct vintage nickel-silver frets. Its owner reports that it looks like a new 51-year-old bass, and sounds as good as it looks, with excellent playability. 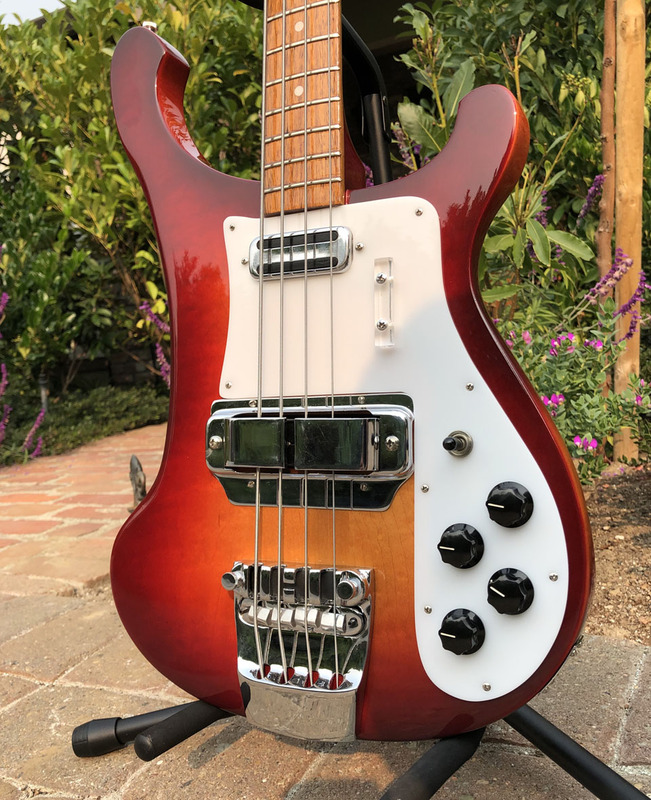 We’re happy to have added another beautifully-refinished Rickenbacker to the worldwide total of resurrected Rickenbackers!